background. I think this will be another iconic picture for the space program almost equal to the blue marble picture of the Earth that the Apollo astronauts took almost 50 years ago. 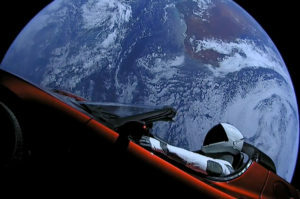 StarMan was placed into a Sun centered elliptical orbit that will take him 20 million miles farther than Mars’s orbit. 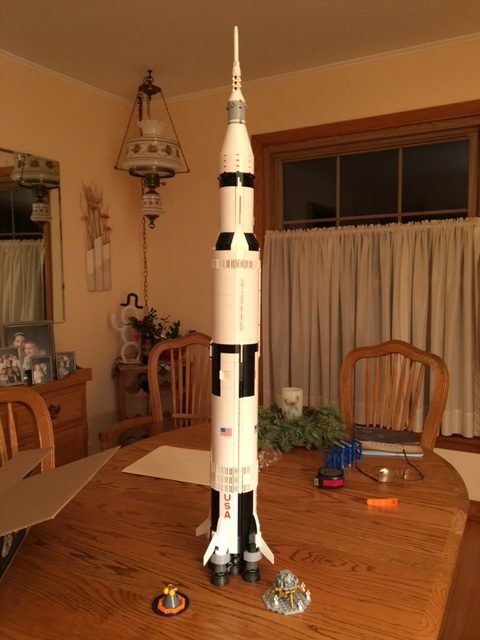 the build of the Lego Saturn V rocket my son bought me. It consisted of 1,969 pieces and a week of enjoyment. 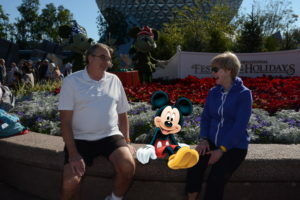 My other proudest moment was down at Walt Disney World. One afternoon our group dined at the “all you can eat” German Pavilion at Epcot. I had an enormous amount of carved pork, beets and various other vegetables, washed it down with a liter of dark beer and finished with 6 pieces of Bavarian cream cheesecake and 2 pieces of Black Forest cake. Then within 90 minutes I went on the Mars simulated blast-off ride. It’s spinning gave me such a G-force that my vision blurred trying to read the console in front of me. I’m happy to say, no German vittles were lost on the mission! 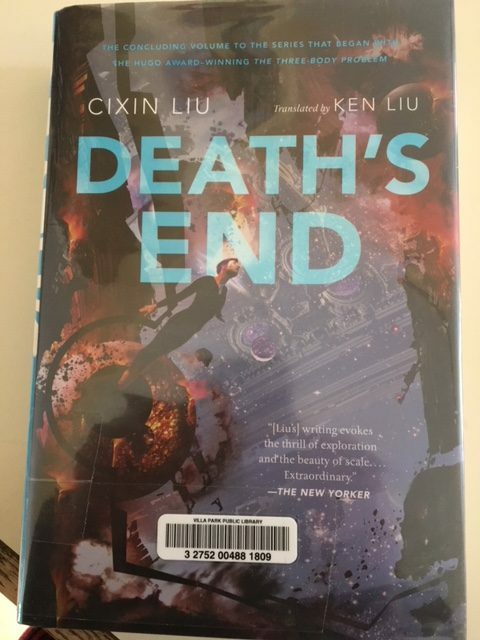 books are titled, “The 3 Body Problem”, “The Dark Forest” and “Death’s End”. He writes from a different viewpoint than any other author I’ve experienced. There were quite a few atom bombs, string theory, relativity effects and multi-universes. For instance, the heroine losses her ability to hook up with her love because 18 million years pass while she’s traveling at near the speed of light. She also has to shovel all the mass from her custom 1 km sized universe back into the original universe because the powers to be want to make the original universe end with a Big Crunch. It was very difficult to remember so many Chinese character names. So I had to keep notes to remember who Liu, Tso and Mio were. Spoiler alert, there also is an attack on the Solar system where it is turned into a 2 dimensional figure. I also read Andy Weir’s second book, “Artemis” about the first city on the moon. I didn’t enjoy it as much as “The Martian” because it deals more with crime and destroying things rather building things. I also read Mike Massimino’s book “Spaceman”. Mike is a pretty down-to-earth and humble guy who did two amazing repair missions of the Hubble Space Telescope. And I like his nickname, “Mass”. My final book was “Origins” by Dan Brown of “DaVinci Code” fame. It was a good story plot on how a new scientific discovery was going to undermine the foundation of the three main religions of Catholics, Jews and Islamists. On a similar subject, Silvio went to a lecture by a Dominican priest who spoke on the subject of how the discovery of ET would affect people. The Catholic church has come a long way since Bruno was burned at the stake for conjecturing about aliens. I gave everyone a quick heads-up about the Smithsonian Channel showing two good programs on March 25, “Billionaire Space Club” and “Earth from Outer Space” and two more on April 1, “Finding Life in Outer Space” and “Leaving Earth or How to Colonize a Planet”. The College of Dupage (COD) and its astronomy programs was the next topic of discussion. Silvio, Harry and I went to listen to astronomer, Joe DalSanto, talk about exoplanets on March 3. He is a very good speaker and has an astronomy course on YouTube with nice concise 20 minutes talks. His next free lecture will be June 23 at 7:30 PM on the Milky Way. There also was a talk by string theory expert, Brian Greene, that Dean and his wife, Beth, Chad, Harry, Phil, and my wife Carol and I attended. Dr. Greene is a very good speaker but much of his material was repeated information that people had heard before. While at the talk, I did put my email address into the COD Astronomy Club and made contact with the Naperville Astronomy Club which seems very active group. There is another free lecture about the “Universe thru Neutrinos” on April 6 which I signed up for and a program with a fee on April 29 about “Exploring Mars” which I also plan to attend. Another topic was that the 8.5 metric ton Chinese spacestation, Tiangong-1 (Heavenly Palace) is scheduled to enter the Earth’s atmosphere sometime between March 29 and April 9. Chicago is one of the places where it could land because it could come down anywhere 43 degrees north or south of the equator. China lost control of the spacestation last year completely making where and when it comes down an unknown. Larger satellites have reentered the atmosphere in an uncontrolled manner, such as the 77 mt Skylab which left debris in Australia and the 40 mt Russian Salyut station in Argentina. My bet is that it will come down on April Fool’s Day. If you want to track it in the sky, sign on to Heavens-Above.com to see when it is visible from Chicago. Just enter you latitude and longitude (for Villa Park, IL 41.8949 N & 87.9787 W) to get an accurate prediction of its path thru the stars. The last miscellaneous topic, was that I saw Friday morning, March 9th, in the Chicago Tribune that the University of Chicago is going to close its association with the Yerkes Observatory in Wisconsin on Oct 1, 2018. The university says it just doesn’t make economic sense to keep the relationship. There will be local meetings on what course of action is available for the 121 year old 77 acre site on Lake Geneva. Locals hope there is some solution that would retain Yerkes as a museum and educational institution for high schools and near by colleges. Dean did some of his astronomical research there and it would be sad to see it be torn down. Now for our main topic. The Falcon Heavy launch on Feb 6. I showed the launch from four different perspectives: 1) CBS evening news coverage; 2) an amazing animation; 3) SpaceX’s live coverage, (worth watching for all the cheers by the SpaceX employees); and 4) The Verge reporter Loren Grush covering on the ground (they watch the launch then run to watch the landings and then get started by the sonic booms). For all the criticism that Elon Musk received for putting his Tesla on top of the rocket, in retrospect, it was brilliant maneuver to generate interest. And putting rocket man on board in the new SpaceX spacesuit that they will used for manned Dragon capsules made it even cooler. The car will circle the sun going from the Earth’s distance from the Sun to 20 million miles farther than Mars for the next several million years. Falcon Heavy can lift 140,660 lbs into Low Earth Orbit (LEO) in its expendable mode for $90 million and 119,000 lbs in its reusable mode for $150 million. It is currently the most capable rocket in lift capacity beating the Delta IV Heavy will its 63,470 lbs lift capacity and $350 million price tag. Think of it, a private company can now lift over twice the capacity of any country’s rocket at one fourth the price. NASA’s new rocket, the SLS, will eventually beat the Falcon Heavy in lift when it debuts in 2020 at 154,000 lbs. But the $2.6 billion that NASA is spending per year to develop the rocket and its associated hardware could purchase 86 Falcon Heavy launches in those 3 years until it flies. The two side boosters landing simultaneously was phenonmenal. They had previously put satellelites into orbit and were reused for this flight. The central core, that Musk had greatly underestimated the amount of strengthening that needed to be done, crashed just off of the barge it was intended to land on. It hit the ocean at 300 mph because all the necessary engines didn’t relight for the last time because it had run out of igniter fluid. This was the first time a rocket with more than 9 engines (Falcon 9 and Rocket Labs Electron rocket both have 9 engines.) successfully launched. Falcon Heavy has 27 engines amongst the 3 core stages. Russia had hoped to use a 30 engine rocket called the N-1 to launch its cosmonauts to the moon in the 1960’s but all 4 of its launches were failures. Musk had said he invested $500 million in the development of Falcon Heavy (FH). FH was announced in April 2011 and was supposed to fly in 2013. The delay was due to the rework that had to be done on the central core stage. SpaceX internally tried three times to cancel the project. Incredibly SpaceX intends to launch FH at least two more times this year. In June they intend to fly 25 satellites mainly for the Department of Defense (DoD) but also including the Light Sail 2 satellite for the Planetary Society. Later in the year another FH will launch an enormous satellite for Saudi Arabia called ArabSat 6. During this initial FH launch, Musk intentionally had the second stage fly through the Van Allen radiation belts for 6 hours before relighting the engine and sending the Testa into the beyond Mars orbit. He did this because the DoD sometimes needs this delay to properly position their satellites. In other SpaceX rocket news, 6 Falcon 9 missions occured since our December 1 meeting: 1) 12/15/17 CRS13 (first time NASA let them reuse a booster and a Dragon supply capsule to supply the ISS); 2) 12/22/17 Iridium Next 31-40 (10 new Iridium satellites); 3) 1/7/18 Zuma mission for DoD (controversy whether it was successful satellite or not because it’s a secret); 4) 1/30/18 SES-16 (a satellite for Luxembourg); 5) 2/22/18 Paz satellite for Spain; and 6) 2/22/18 Hispasat 30W-6 satellite again for Spain. This last launch was their 50th Falcon 9 launch. Falcon 9 debuted in 2011 with a lift of 10.5 tons and now 7 years later can lift over 26 tons almost tripling its capacity. NASA thought it would take SpaceX $4 billion to develop Falcon 9 and they did it initially for $300 million. They subsequently have invested $1 billion into increased capability and reusability. On the Paz mission SpaceX tried to recover the fairings which cost $3 million for each half. The catcher’s mitt “claw” boat, Mr. Steven, didn’t quite catch a fairing in its net but did hoist a floating fairing on board. The fairings drop from up to 100 km height and are now fitted with cold gas thrusters and a parasail. The fairings cost 10% of the $62 million Falcon 9 reusable mission. The first stage recovery gets another 60% of the cost back. Only the 30% of the rocket is not recovered in the second stage. On the Paz mission SpaceX also launched two test satellites for its StarLink constellation plans. StarLink will be a fleet of 4425 satellites in 83 planes of 1200 km orbits that will provide cheap Internet with low latency. Later an additional 7518 satellites in 340 km orbits will complete the project. Musk plans to fund much of his future rocket development with income from the StarLink project. The last bit of SpaceX news is that his final version of the Falcon 9, the Block5 version, is soon to fly. It was seen traveling on the highway out to the Texas facility for testing. The Block5 is said to improve thrust by 10%, vastly improve reusability and includes about 100 small changes and improvements like better landing legs, increased reliability and manufacturability. With this version SpaceX expects 12 flights per booster rather then the previous 2 or 3 and reduced time to refurbish and refly. The Block5 is intended to be the version for manned missions to the ISS. NASA has said that 7 successful launches have to occur before any manned missions can occur. Musk says this will end inprovement of the Falcon 9 and he plans to retool his factory for his next rocket, the BFR, by the fall of 2018. We also discussed the status of the Google Lunar X Prize. The deadline was extended to March 31, 2018 in December of last year but it looks like none of the teams will make an attempt to garner the $20 million first prize. In January 2018, TeamIndus from India and the piggy-backed Hakuto probe from Japan both dropped out due to a lack of last minute funding. Moon Express relies on Rocket Lab’s Electron rocket which placed a satellite in orbit on its second launch but their current rocket doesn’t have the necessary power for a moon mission. SpaceIL from Israel hoped to launch on a Falcon 9 but came up short on funding. Synergy Moon has an agreement with Interorbital System’s Neptune 8 rocket but the rocket has not yet flown. The Prize has been around for 10 years but Google has not shown any interest in extending any longer. They have given out about $6 million in milestone awards to the teams. In 2007 the original goal was by the end of 2014. A few years after the prize was announced, water ice was discovered in large amounts on the moon’s surface. The goal of mining this new resource should be enough of an incentive for future exploration. Moon Express says they intend on continuing the effort and hope for a 2018 launch. Astrobotics, a US team from Carniege-Mellon University, which dropped out last year says they intend to launch to the moon in 2020. The team most likely to be first to the moon is SpaceIL they still intend to piggyback on a Falcon 9 rocket and land on the moon in 2018. Rocket Labs had a successful second launch attempt of their Electron rocket from New Zealand. The Electron is capable of putting 500 lbs into orbit. It will be a good rocket for cubesats which are small satellites built on multiples of a 10x10x10 cm size and 3 lb weight. Cubesats are composed of off-the-shelf components like smart phones for their central computer. Rocket Labs put 3 cubesats into orbit plus a 3 meter diameter disco ball called Humanity Star. The disco ball drew some criticism from scientists. Humanity Star only reaches about magnitude 4 in brightness but you can try to see it traveling across the stars with the Heavens-Above.com website. Rocket Labs, which is an American company, hopes to eventually launch on a weekly basis for only $7 million per rocket. 60 Years of the USA in Space with the Explorer 1 launch on January 31, 1958. Our first satellite discovered the Van Allen radiation belts. I still remember the failures of the Vanguard rockets and then the switch to the Redstone developed by Wernher von Braun to get the US into space. January 25 was the day of rememberance for the 17 astronauts lost in the US space program. It is amazing that the 3 catastrophes all occured within 6 days of the year. Columbia broke up with the loss of 7 astronauts on return to Earth on February 1, 2003, Challenger exploded on January 28, 1986 with the loss of 7 and the Apollo fire killed 3 when it happened on January 27, 1967. A piece of meteorite discovered in Michigan was donated to the Field Museum. It is the size of a golf ball and was discovered on a frozen lake. The original meteor may have been about 6 feet in diameter and broke up maybe 20 miles high on January 16, 2018. It cause a bright flash and boom. The meteorite was found only 2 days after it fell. We didn’t get to discuss the following items but thought I’d include them in the notes to reduce topics for next meeting. Astronomers glimpse the cosmic dawn’s early light – Another 3/9/18 Chicago Tribune article. Researchers saw a faint signal in FM radio waves that indicated ultraviolet light from the first stars 180 million years after the Big Bang. The signal was 10,000 times fainter than the background noise so they had to go to a quiet location in the Australian desert. Universe initially consisted of 75% hydrogen and 25% helium by mass neutral gas (since an atom of helium 4 weighs 4 times the weight of hydrogen atom that ratio is one He atom to 12 atoms of H). The period before these first stars is called the “Dark Ages”. Because the gas that interacted with the ultraviolet light was only 5 degrees above absolute zero rather than the predicted 10 degrees, scientists feel that dark matter was interacting with it. This is the first indirect detection of dark matter other than through gravity. Although the results were cross checked for 2 years, the study still needs independent confirmation. It is all based on a range of wavelengths of light as the ultraviolet light excited the gas and turned it from neutral atoms into ions. Scientists have predicted that these early stars were strange compared to present days ones, being much larger and hotter because there were no heavier elements yet. The study doesn’t say when these stars formed, just that they existed at this time. Dark matter is computed to make up 27% of the universe (6-7 times the mass of normal matter). The 5 minute video is a great synosis of the universe’s evolution. It says galaxies don’t form until 200 million years after Big Bang. The “time line” still image is the best visualization of stages of the universe. Worlds most powerful rockets. 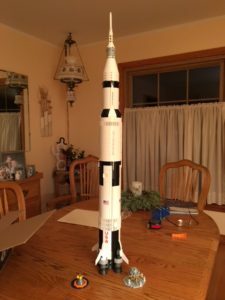 Falcon Heavy, BFR, SLS, Saturn V and New Glenn rockets. Falcon Heavy is current most capable. Saturn V has the all time record but BFR and SLS will exceed it. The 2020 version of SLS will have to go thru 2 upgrades before it will exceed Saturn V.
Oldest black hole found. On 12/9/17 a telescope in Chile found a black hole (BH) 800 million times the mass of the Sun and 13 billion light years away. It existed only 690 million years after the Big Bang at 5% (if the Universe is a 50 year old, this BH is a 2.5 year old toddler) of current age of the universe. The Universe was just emerging from an era know as “the Dark Ages” (380,000 to 150 million years) when neutral hydrogen gas pervaded the cosmos. After stars formed and gave off ultraviolet radiation that ionized the hydrogen atoms (reionization, because after Bing Bang (BB) everything was initially ionized). There is new information that the first stars existed only 180 million years after BB. At 380,000 years after BB, neutral hydrogen atoms form and universe becomes transparent allowing cosmic background radiation to be released. Free electrons can absorb any wavelength of light whereas an electron in a hydrogen atom can only absorb certain wavelengths. At the reionization phase matter is diffused enough by the expansion of the universe that is still remains transparent. Remember a Kerr (rotating) black hole can be 42% efficient in turning accreted matter into energy which helps black holes be so bright. But how does it get to be 800 million times the mass of the Sun in 500 million years. Scientists don’t think the first stars formed until 100-200 million years after the BB. Blue Origin flies its 2.0 version of sub-orbital New Shepard – 12/12/17 Launched from west Texas. Company relatively quiet in 2017. In 2015 they were the first to vertically land a rocket and would go on to launch the same New Shepard vehicle 5 times. The new capsule actually has windows rather than ones painted on. It carried some experiments and a dummy named, Mannequin Skywalker. Planning for first customers in early 2019. No ticket price yet. Customers would get an 11 minute flight into space rising up to 62 miles and experience 3 minutes of microgravity. New Glenn will be their bigger rocket powered by the new BE-4 engine. The engine is also to be used on the Vulcan rocket for ULA. Here is a short video of mission. Juno discovers Jupiter’s Red Spot is at least 350 km deep – The source of the spot is as deep as the ISS is above Earth. Juno discovery was made using the microwave radiometer instrument. The Red Spot is 16,000 km wide and warmer at the bottom which could explain winds of 120 mps (270 mph). Rising winds give the spot the sunburned red color. Greenbank radio telescope will probe Oumuamua for signs of life – Oumuamua is Hawaiian for Messenger. Heading out of solar system at 196,000 mph, quarter mile long (400 m) but only 40 meters wide. Described as a dark red metallic cylindrical object (before it was described as “cigar shaped”, now they are they trying to give it intelligent design characteristics, “metallic cylindrical”). Scientists looking at the object are with Breakthrough Listen, a $100 million initiative backed by Russian billionaire Yuri Milner. With their sensitivity they could detect a wifi router or telephone handset transmitting if Oumuamua has them. NASA New Frontiers Mission down to two Finalists – The winner will be the 4th mission in series. NASA has 3 types of missions, 1) Flagships costing > $1 billion like Curiosity, Cassini; 2) New Frontiers which are capped at $1 billion like New Horizons, Juno, Osiris-Rex (which will sample the asteroid Bennu) and; 3) Discovery missions costing $450-600 million like Dawn, Lucy and Psyche. Finalists will launch in 2025. The first finalist is Dragonfly (15 minute video on website), a nuclear powered quadcopter drone to explore various sites on Titan. Titan’s atmosphere is 4 times as dense and the gravity is only 1/7 that of Earth. It uses a parachute to slow down but lands under it’s own power. A day on Titan lasts 16 Earth days. The second finalist, CAESAR (Comet Astrobiology Exploration Sample Return), would go to 67/P Churyumov-Gerasimenko which Rosetta studied and get a 100 gram sample. The sample would return to Earth in Nov 20, 2038. US Led in Rocket Launches in 2017 – We had 29 successful launches. It was the first time since 2003 that we led in launches. Russia was second with 20 and China 19. In 2016 US and China tied for the lead with 22 each. China and Russia each had a failure last year. SpaceX was responsible for 18 missions. SpaceX has the goal for 2018 of 25-30 launches. United Launch Alliance (ULA) the other major US launch company had 8 with 6 on the Atlas V and 2 on Delta rockets. Another US company, Orbital ATK, had 1 launch. Orbital ATK also plans 2 Minotaur launches in 2018. Layers of ice found on cliffs on Mars – The ice is buried a meter or 2 below surface. The cliffs are 55 degrees of farther north and south of the equator. The terain appears to be banded, so a core sample would be a treasure trove of past conditions on Mars. Planned additions to launch pads at KSC and 1 in Texas – plans for New Glenn and Electron rockets in Florida and SpaceX in Texas. New Horizons breaks record for the farthest picture –The spacecraft flew past Pluto on July 14, 2015. It is now zipping at 700,000 mi /day. On Dec 5, 2017, it broke Voyager 1 record set in 1990. New Horizons took picture of a group of stars known as the Wishing Well and two Kuiper Belt Objects (KBO) at 3.79 billion miles from Earth. Voyager 1 took the “pale blue dot” at 3.75 billion miles on Feb 14, 1990. New Horizons is now waiting for Jan 1, 2019 when it goes past 2014 MU69. No new name has be announced yet for the object. Voyager 1 farther than New Horizons but the camera is shut off. KBO are about 100 km in diameter but too small to be classified as dwarf planets. New rockets under development – Vulcan, Ariane 6, New Glenn, Virgin LauncherOne, StratoLaunch, China’s shuttle, SLS, BFR. By not building second mobile launcher for SLS, NASA will lock in a 33 month delay between the rocket’s first and second launches. It looks like first manned launch on SLS won’t be before 2025. By 2025 we will have spent close to $50 billion on SLS & Orion. 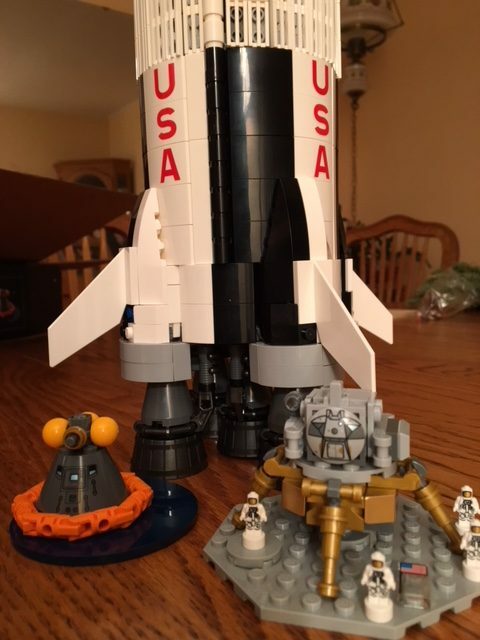 21 years from concept to launch with repurposed shuttle technology. Because of our lengthly coverage of SpaceX’s rockets we didn’t start our revisit of the original Cosmos series by Carl Sagan. We hope to start that with the next meeting. Dean has a study-guide that goes with the episodes on DVD and the chapters in the book. We’ll also discuss how new developments in the intervening years have changed our thinking on many of the topics.